When faith is tested, and you are left unsure of who you are and what you believe in, return to the fundamentals of your faith. Just as in basketball, the strength of your fundamentals determines your endurance, personal growth, and success in life. On Sunday, March 25, 2018, Pastor Chad reminds us again of the important basics of faith that are too often forgotten or ignored. One day, everything seems right. Birds are singing. Sun is shining. Life is grand. Then, unexpectedly, you face opposition, and nothing is going according to plan. The world has turned against you. In a topsy-turvy, every-changing life, we can be grateful that God remains the same. His grace is an overflowing constant in both the good and the bad. On Sunday, March 18, 2018, Pastor Chad Gilligan continues from the book of Acts and preaches on embracing God’s grace in our lives. Call it your soul, your mind, your spirit. Regardless of what you call it, God created every person with a spiritual side and a physical side. While often forgotten and neglected, our spiritual side impacts us daily just as much as our physical body. On Sunday, March 11, Pastor Chad Gilligan continues from the book of Acts and speaks on Three Spiritual Realities of Life. Looking for a new job? A spouse? Or direction in your life? With so many unknowns, it can be hard making the right decision. God wants the very best for His people, but how can we know His will? And will we recognize His voice when He does speak to us? On Sunday, March 4, 2018, Pastor Chad Gilligan speaks on the call of God, understanding His will, and hearing His voice. Thousands and thousands of churches around the world practice communion. Sometimes, it seems so common place that we forget why it really matters. On Sunday, February 25, 2018, Pastor Chad Gilligan takes times to reflect on the importance of Communion and the judgment we invite into our lives when we disregard its true meaning. No one sees their potential. No one is willing to invest in their life. But God knows and he's calling you to do more that what's expected and invest in someone unlikely. There are people all around us that need someone to take a chance on them and see what God can do. On Sunday, February 18, Isaac Smythia challenges us to serve God and others in the Barnabas way. Relational tension is a part of life, but it is how we respond that determines our self-destruction or success. On Sunday, February 11, 2018, Pastor Chad Gilligan warns against pride and selfish ambition with the tell-tale story of Herod Agrippa. Prayer is meant to be so much more than a bedtime ritual, thanks before a meal, or a shopping list of needs. When we align ourselves with God’s will, prayer can become a life-altering event of purpose and perspective. Don’t miss out on what God has intended for you! On Sunday, February 4, 2018, Pastor Chad challenges us to pray and then wait for the amazing surprises God has planned. In the midst of a changing culture, the church may seem irrelevant, misguided, and even the wrong side of history. But, the Church is resilient. It stands the test of time, no matter the opposition or persecution. And its truth remains the same today as it did thousands of years ago. On Sunday, January 28, 2018, Pastor Chad looks at the early days of the Church, revealing its purpose and debunking myths held today. People are God's priority. He is constantly working behind the scenes on behalf of believers and non-believers alike to draw everyone closer to Him. If God feels distant in your life, evaluate your priorities. Are they the same as God's? Or do you put yourself first? 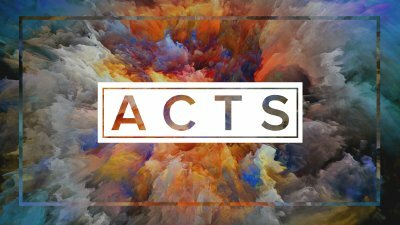 On Sunday, January 21, 2018, Pastor Chad Gilligan continues his study on the book of Acts and encourages us to think and act like Jesus. God challenges us to step outside our comfort zone and do exceptional things. While these times of transition may seem difficult, we can have faith that God has already prepared the way for us, if only we are willing to take the step of faith. On Sunday, January 14, 2018, Calvary welcomes guest speaker, Dr. Wave Nunnally, as he preaches on the transition of the early Church and how from Biblical times to today, God is in the smallest details, working on our behalf. Right now, no matter your age or who you are, you are creating a legacy. Your words and actions today will have lasting impact on those around you. You decide how people will remember you, whether it will it be for your consistency of character or selfish pursuits. On Sunday, January 7, 2018, Pastor Chad Gilligan continues from his study on the book of Acts and gives us steps on how to leave a life-giving legacy. You can lie to your family. You can lie to your friends. You can even lie to yourself. But you cannot lie to God. God knows when you have ulterior motives, even while doing good things. On Sunday, October 1, 2017, Pastor Chad preaches about the importance of honesty and integrity from the book of Acts. When you’re back is against the wall and you’re at the end of your rope; you’re not sure what to do; who has your back? Who can you call on to help get you through? On Sunday, September 24, 2017, Pastor Chad Gilligan teaches on the partnership between us and God. In this message, we learn how to trust God when there is a challenge and how to shift our mind into making God bigger than our problems. Every day, the world becomes more corrupt, behavior more questionable, and opinions louder. When Christians are asked to step into the gray areas to protect our job, our family, our reputation, how do we respond? On Sunday, September 17, 2017, Pastor Chad helps us navigate the truths of God’s Word against popular majority.